A TV actor is taking time out of his EastEnders filming schedule to coach teenagers in Harlow. 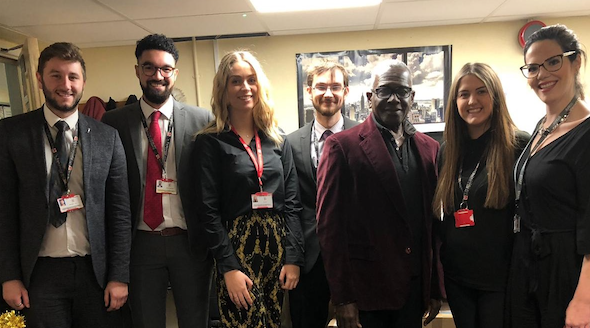 Rudolph Walker, who plays Patrick Truman in the long-running BBC soap opera, is working with students at Burnt Mill Academy with a passion for media. The Rudolph Walker Inter-School Drama Award nurtures and develops the creative and technical skills and talents of young people. The Year 7 to 10 students spent time with the actor who introduced the initiative during a surprise visit to the school. They will now work on a performance before the actor pairs them up with one of his fellow EastEnders stars who will act as a mentor for the group. Georgina Woods, head of performing arts, said: “Rudolph spoke with students about his career and how he got into the industry after moving here from Trinidad in the 1960s. He also took part in a Q&A sessions with students; so many wanted to take part in this project. “This is a really exciting opportunity for our students; not just those who are taking performing arts, but for anyone with an interest in this area. “This project will help to raise self-esteem and give students a purpose and something to do outside of school. Students will perform their own drama piece against other schools at an awards event in March in front of an audience including more EastEnders stars.